Travellers have always come to Winnipeg. Either to stay or to make money and then move on. Those who moved on took their value from the city and its economic possibilities. But they also left behind a little part of themselves and their culture. But this is in a fairly recent past. Originally the travellers to Winnipeg were Cree, Dakota, Ojibwa and so on for millennia before even a white man set foot on this continent. 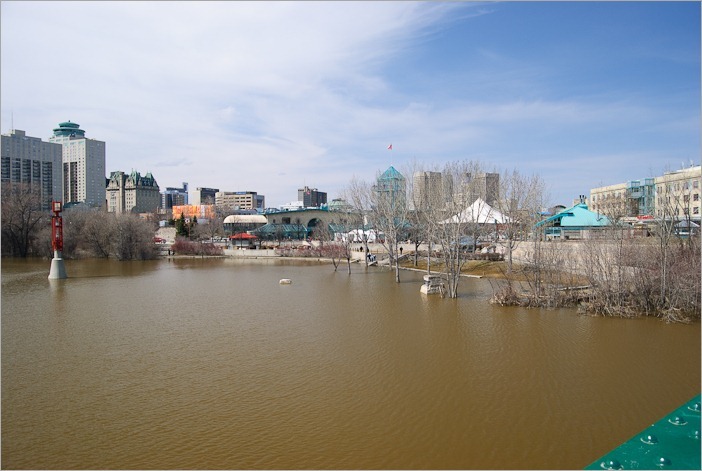 The Forks, the confluence of the Assiniboine river and the Red river was known for its community of traders and trappers. Today it’s still a place for travellers as well as for inhabitants. The rivers were famous for their troubled quality of the water. The water was always rather muddy, in the original tongues spoken here it was called winnipeg, or muddy waters. 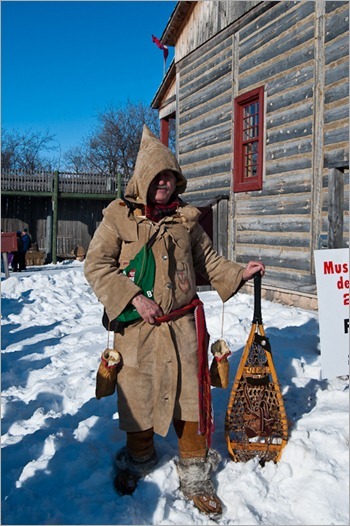 In the French quarter of the city, known as Saint Boniface, an idea started 41 years ago to create a festival to the honour of the travellers. It would present the cultures of the travellers, the ones that stayed or from the ones that moved on. The festival is held all over the city, although mostly contained in Fort Gibraltar in Whittier Park. 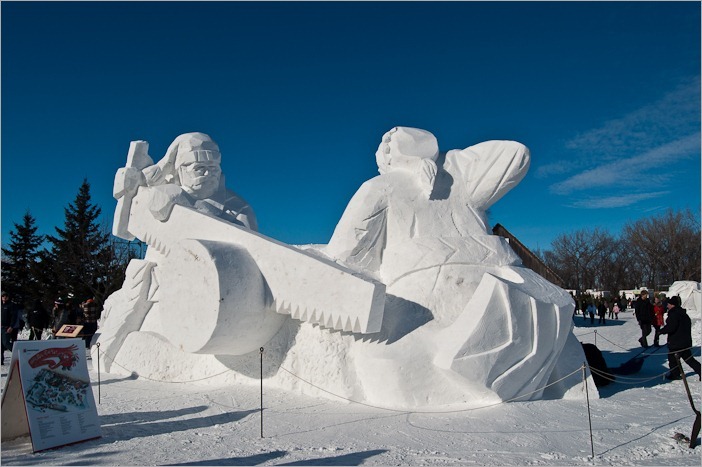 For the occasion the park is renamed to Voyageur Park. 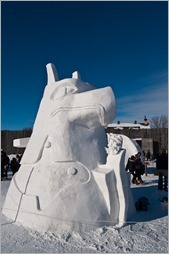 Here you can find activities for the children and not so children, snow sculptures, musical groups (I wouldn’t want to insult them by calling them rock groups), Indian healers, children’s care and, of course, the caribou hut, also known as the bar. There are many places to eat and drink and get souvenirs. 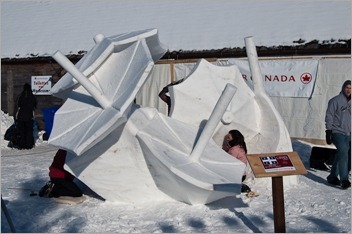 The most prominent event of the Voyageur Park is the Snow Sculpture contest. 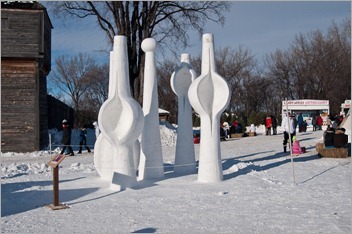 Sculptors from all over the world, even from places where the snow never falls, are gathered here to win the grand prize (which eluded me for now). 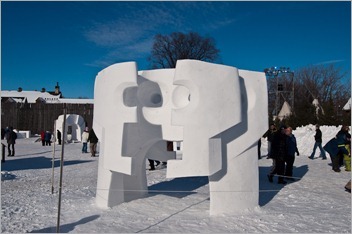 Sculptors from Winnipeg, France, Mexico (! 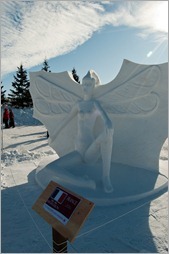 ), Québec or Italy are here to show their freezing art. The next part is Fort Gibraltar, a rebuilt original traders fort. A part from one side (facing the river) where people could defend the fort with muskets, there are no fortifications here. 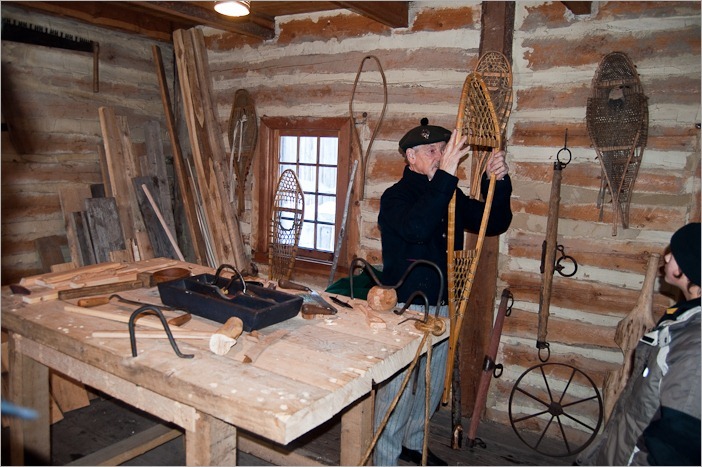 All buildings have a “civic” function, like the blacksmith’s the trading post’s and some houses. 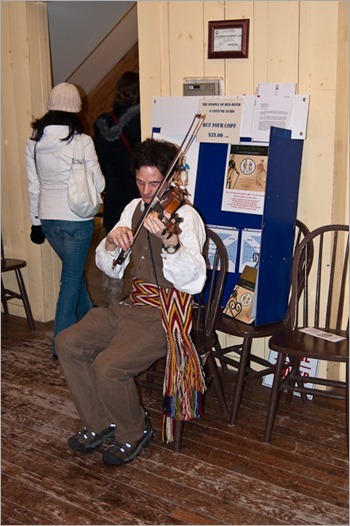 For the festival, these places are again filled with original inhabitants in costume and talking the way they used to, decades ago. In the dark near the roof of one of these buildings you can still see the furs, ready to be traded, come next summer. Other people are walking around in costume, telling their tale to whom wants to listen. This man for example has made all of his clothes himself, his shoes were made in the seventies (hmm 1970’s or 1870’s?) and his coat is real leather. 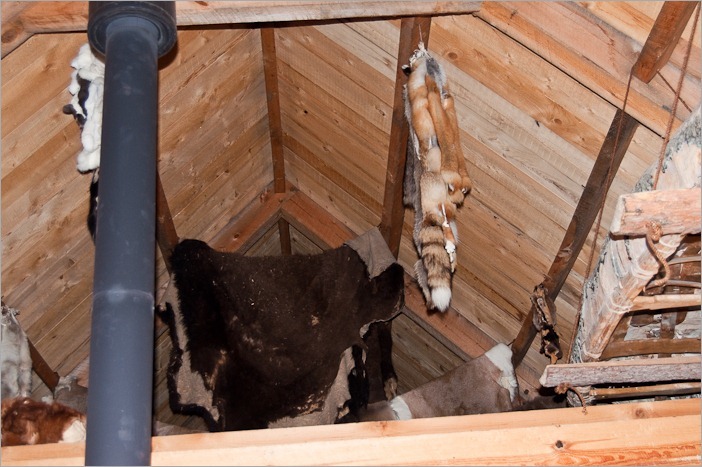 The central building holds an exhibition of old trades and household activities. 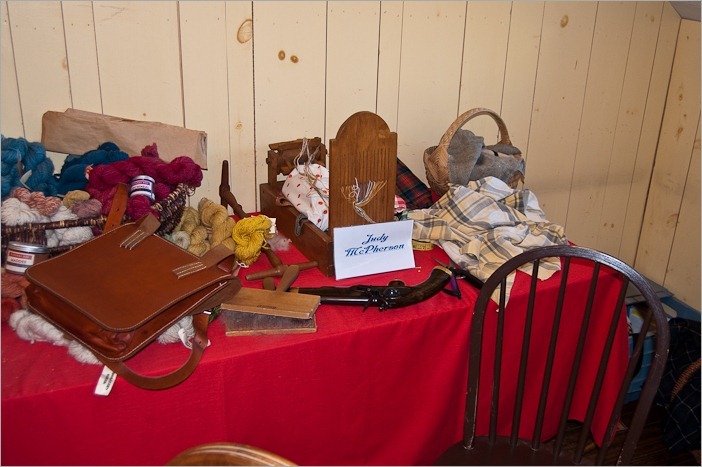 Here, the women’s place, wool, cloth and… Yes the pistol was there too, probably to protect against wild animals and strangers, not necessarily in that order. Music is everywhere, preferably original with real musicians. Rhythm is given with the foot, melody with the instrument, or is the foot also an instrument? Click here to subscribe to the feed for this blog and don’t miss the next post again, ever!